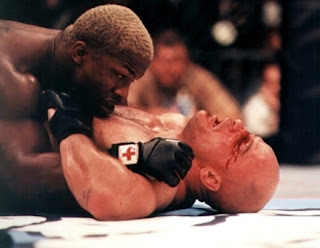 While Randleman used his wrestling skill to score several takedowns, the judges narrowly declared Rutten to be the new UFC heavyweight champion. In the co-main event, Pedro Rizzo knocked out Tra Telligman with a right to the jaw at 4:30. Rizzo continued his hot streak, as he was coming off wins over Mark Coleman and Tank Abbott. Pete Williams, coming into UFC with a 1-1 record, tapped out Travis Fulton at 6:28 with an armlock. Although Fulton lost this bout, the “Iron Man’ came into the night with more than 50 victories and racked up an astounding 253 wins before he turned 40. “The Axe Murderer” Wanderlei Silva score his first UFC win a knee-strike knockout win over Tony Petarra at 2:53. Silva had lost his first UFC fight to Vitor Belfort at Ultimate Brazil in 44 seconds. In the first two PPV bouts, LaVerne Clark beat Fabiano Iha by TKO at 1:31, and Marcelo Mello defeated David Roberts by TKO at 1:23. Before the show went on the air, Ron “H2O” Waterman won his UFC debut with a 28-second TKO win over Chris Condo. Waterman also appeared in Pride, New Japan Pro Wrestling and the WWF.